How a Pope Can Make a Difference–1939 and now. Pope Benedict XVI’s abrupt decision to resign reminds us of the departure of another pope exactly seventy-four years ago this week, a moment at which the Roman Catholic Church faced a different crisis. 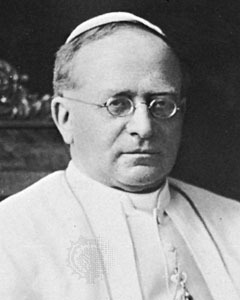 Pope Pius XI had died on February 10, 1939 and the world was on the brink of a second war. As the Nazis massed forces against Europe, in Rome Pius XI was engaged in a last-minute effort to awaken world leaders against Hitler, Mussolini and the Nazi campaign against the Jews. But the pope faced dissidents within the Vatican. I’ve just finished a book about Pius XI and his challenge to Hitler — The Pope’s Last Crusade — which comes out in March. Just as now, the Catholic Church was divided among factions that would either modernize and deal squarely and openly with injustice, or retreat, circle in closely and insulate their institution from the outside world. Now the challenge involves moral values – including the response of the Catholic leadership to a sexual abuse scandal that has traumatized the conscience of the clergy in Europe and America. But then, on the eve of World War II, the Vatican was dealing with a different, vast moral question – how or even whether to battle and confront Hitler and the murderous machine descending on Europe. When people think of the Vatican during World War II, they think not of this pope but of his successor–Pius XII–who has often been criticized and condemned for his silence during the war. But before that, there was a little-remembered pope, Pius XI, loudly outspoken against the Nazis and determined to call attention to their atrocities. The pope did not resign; he pleaded with his doctors to help him stay alive long enough to issue a major declaration against Hitler and anti-Semitism. Benedict XVI’s departure – he is the first pontiff to resign in more than 600 years – gives the Roman Catholic Church a chance once more to decide between modern and conservative values and to clarify its role in the world. At key moments in history, the rare decision to choose a new pontiff has extended beyond the confines of the Vatican and beyond the hopes of the world’s Roman Catholics. The challenges are different but the essence is the same – will the Catholic Church act forcefully to confront injustice? Or will it withdraw quietly and declare tacitly that religion must be cloistered from politics and justice.